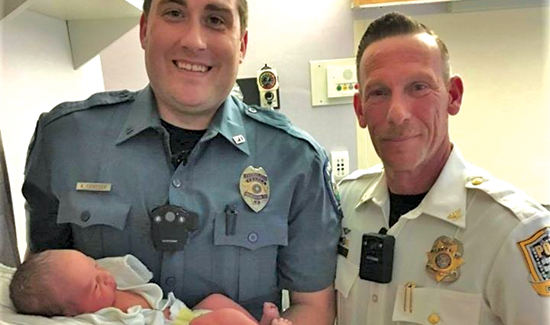 While that might be true, technically speaking, there are a ton of officers, deputies, and troopers that manage to do things like deliver babies, handle emotionally disturbed persons, and defuse potentially violent family disputes. In Pennsylvania, for instance, two cops helped deliver a baby in the back of the parents’ car recently. Jayce, thanks to two officers, is the newest edition to the Diaz family. “It just felt crazy. It was like a whirlwind. Like a movie. I just never thought this would happen to us,” Jennifer Diaz of Quakertown, Pennsylvania, said. It was close to midnight when Jennifer knew it was time to go the hospital. The contractions were intense. Jennifer and her husband, Matt, got in the car and headed towards Doylestown Hospital. They were in the car for just five minutes when Jennifer’s water broke. “She said, ‘My water broke.’ And she started to scream and I’ve never heard her scream like this before and she said, ‘He’s coming, he’s coming, he’s coming.’ So I called 911 and pulled over in a parking lot,” Matt said. Enter Officer Robert Compton of Bedminster Township Police and Chief Brian Lehman of Dublin Borough. These are the guys you hope and pray are around for this kind of thing. “I knew it was imminent immediately when the baby was crowning. This was definitely going to happen and the ambulance wasn’t going to get here,” Chief Lehman said. “She had pushed at one point and the head then came out and then after a few minutes, then had pushed more, and the baby came out. I literally had to catch it,” Officer Compton told ABC 16 News. “Officer Compton came out and he laid Jayce on her chest. He said, ‘Well, I guess this is a good time to introduce myself. My name is Bob. Congratulations.’ So it was awesome,” Matt said. The Diaz family couldn’t be more grateful. “Very thankful,” an understandably exhausted Jennifer said. When Matt, Jennifer, and Jayce were loaded safely in the ambulance and off to the hospital, the two cops got a coffee. They had a minute or two to discuss the thrill of helping deliver a baby before they went back to work.